As last season ended, Chris Paul and James Harden had the same revelation: They could not beat the Warriors alone. In this ESPN The Magazine cover story, we ask: Can they beat them together? This is the cover story of ESPN The Magazine's Oct. 30 NBA Preview issue. Subscribe today! James Harden's phone was squawking again. It had been yowling at him for weeks, ever since his implosion in Game 6 of the Western Conference semifinals, when the most efficient offensive player in the NBA had wilted in the most critical game of his life. Most of the communication he'd received was sympathetic. Text messages like "u OK?" or "stay strong," even "praying for u." Harden had dodged it all by simply not responding, but it was harder to ignore the criticism that had seemingly obliterated his season. Remember his league-leading 15 win shares? Remember how he was the first player in NBA history with 2,000 points, 900 assists and 600 rebounds? All forgotten, reduced to rubble in the wake of his inexplicable collapse. In that elimination loss on May 11, a 39-point beatdown at home, Harden appeared so discombobulated that speculation mounted that he'd played concussed after an errant Pau Gasol elbow the game before. Harden rejected that notion, assumed full responsibility for the debacle -- including his 2-for-11 shooting, 6 fouls and 6 turnovers -- then retreated to Atlanta for some privacy and reflection. "Sometimes," Harden says, "I want to sit in my little box and be left alone." Now, on June 25, Harden was dining with friends in LA when his phone lit up. Again. He glanced at his caller ID and excused himself from the table. "Gotta take this one," he said. When he stepped outside, the name on the screen gleamed back at him: Chris Paul. "What do you mean you're in?" Harden asked. Harden and Paul were friends, and they had traded texts throughout the season. 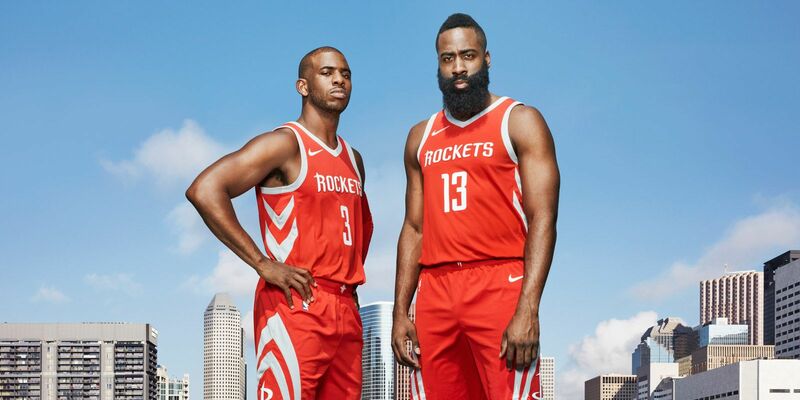 CP3, he knew, was examining his pending free agent options, and Harden was hopeful Houston was on Paul's short list, but he was in the dark about where Paul was leaning. "I mean I'm in," Paul repeated. "I want to come to Houston. I want to play with you." Rockets general manager Daryl Morey had lusted after Paul for more than a decade. He was part of a Celtics staff back in 2005 that tried to deal its star, Paul Pierce, on draft night for the rights to the rookie point guard. As Houston's GM, Morey tried to trade for Paul in December 2011, when he was dealt from New Orleans to the Clippers. In 2013, the last time CP3's contract was up, Morey presented him with a custom-designed Chris Paul and Little Chris bobblehead. The rendition of the point guard and his son didn't land them a face-to-face free agency meeting, but for some reason, even after Paul re-upped with the Clippers, he held on to that bobblehead. And Morey held on to the dream. So it was that in Morey's war room this offseason, Houston's 2017 free agency whiteboard was dominated by his "decision tree": a phalanx of available players, myriad numbers, some arrows, formulas, hypotheticals and one name circled in red marker: Chris Paul. THE END FOR both men was swift and cruel. As Harden sat at his locker after Game 6, alone, the helplessness reverberated. Player development coach Irving Roland, who had been training Harden as a skills coach on and off for eight years, quietly engaged in their signature handshake, then backed away. "It was almost like everybody had a fear about talking to him," Roland says. "You could see how much he was hurting. How do you approach him? Will he freak out if you talk to him?" That didn't stop veteran Rockets forward Trevor Ariza from walking over and slinging his arm around Harden's shoulder: "This was a good experience for you, 100 percent," Ariza said, reminding Harden that every great -- Magic, Jordan, LeBron -- had terrible moments in his career. "It's a pretty powerful thing when everyone is looking at you, pointing at you and saying all these things about you. How you going to handle it?" Typically, in the weeks after the end of a season, Roland and Harden would reconvene for workouts. This time Harden had taken a trip to Paris and Barcelona to recharge. In his absence, Roland had actually fielded calls inquiring about whether Harden had shaved points or even thrown the game. It was, Rockets coach Mike D'Antoni says now, "a case of the whole year mounting up. He was doing so much for us. Maybe there were some situations where we could have rested him more. But he was chasing the MVP a little bit, and what Russell [Westbrook] was doing didn't help any, because after he gets another triple-double, James is thinking, Oh, great, now I gotta really roll. "We talked about it, but there was no answer to it," D'Antoni says. "I wanted him to be MVP. I told him, 'Let's go for it.' But having that and the majority of the offense in his hands was difficult." The burden, Harden concedes, was too weighty. "It's pretty tough to be depended on to make every single play," he says. "It wears on you when you don't have someone to relieve some of that for you, when you don't have that guy who you can throw the ball to for three or four possessions in a row and say, 'Go make a play.'" Eleven days earlier, and some 1,500 miles to the west, Chris Paul's final Clippers playoff game was like so many others: disheartening. He had been superb throughout the first-round series with Utah, bearing the workload at a near-historic clip after Blake Griffin had been felled yet again by a medical malady -- this time a toe injury. Paul had dropped 29 points and eight assists in a road victory in Game 6 to keep the Clippers afloat; he was averaging 27.3 and 10 for the series. But in Game 7, after being held to 13 points on 6-of-19 shooting, he had departed from Staples Center feeling the burn of an old familiar refrain: "Will he ever win the big one?" If he did, Paul concluded, it would have to be elsewhere. The scar tissue with the franchise had simply grown too thick. His turnover against Westbrook in the 2014 playoffs -- the one that allowed a game-stealing shot in a pivotal Game 5 loss to OKC -- still gnawed at him. He lamented the lack of another playmaker. As for persistent reports of dysfunction in the locker room, Paul says, "I think the communication could have been a lot better there." The disconnect between Paul and Griffin was a known, unspoken reality, yet never one that was overtly disruptive or explosive. "Blake and Chris had their ups and downs, but they already had that when I got there [in 2015]," former Clippers forward Luc Mbah a Moute says. "You couldn't even tell. They didn't argue on the court. They didn't sit apart from each other off the court. "Lots of teams have issues, but it was magnified with us because we lost in the first round." Says J.J. Redick, who played with Paul for four seasons in Los Angeles: "I tried to wrap my head around why we never won a championship or why, at times, there was friction with our team. I don't have a good explanation for it. I would say, as Chris did, that at times it felt laborsome, burdensome." It was time, Paul sensed, for a fresh start -- with a team that would embrace his input, not chafe at it. "We just ran our course there," Paul says. Houston, he determined, would be a better fit. ON THE NIGHT of June 27, Chris Paul was hanging at 1 Oak in West Hollywood with LeBron James. The club thumped as Paul and LeBron exchanged greetings with Tristan Thompson and Joe Johnson, who dined with his wife at a nearby booth. When the clock struck 1 a.m. and they began plotting their exit from the private entrance ahead of the paparazzi, Paul noticed a text from his agent, Leon Rose. The trade to Houston had been consummated. Through a series of complex transactions -- including the acquisitions of Darrun Hilliard from Detroit and DeAndre Liggins from Dallas, then flipping them to the Clippers as part of a package for Paul -- the Rockets had swapped Patrick Beverley, Lou Williams, Sam Dekker, Montrezl Harrell, Kyle Wiltjer and a future first-round pick for their All-Star. Paul was about to alter the power structure of the NBA. He was also about to take aim at the very player sitting next to him. "LeBron's my man, but he didn't know," Paul says now. "I didn't tell him initially because even though we're so close, we're also ultracompetitive." Twenty minutes later, Paul finally revealed his secret. LeBron's response? He ordered shots of Don Julio 1942 tequila and clinked glasses with his friend. It was a genuine sentiment yet one easier dispensed by a superstar in the Eastern Conference. Both James and Paul knew, even as the deal went down, that Golden State remained the title favorite. After the trade was announced, Houston's title odds rose from 30-1 to 15-1. The Warriors remained at 5-11. Still, Morey wasn't interested in Vegas' numbers. He had his own data to suggest that Paul would be a game changer, particularly in taking pressure off Harden. According to ESPN Stats & Information, when Harden's usage rate increased by 10 percent, his defensive effectiveness declined by 12 percent. Paul, meanwhile, had posted four of the top 100 seasons all time in defensive win shares among guards. Three hours later, at 4 a.m., when Morey FaceTimed his new guard at Paul's California home, he discovered his newest acquisition clutching the bobblehead. "See?" Paul smiled, waving it at Morey. "It's fate." To Harden, it looked like a weapon to fight the Warriors. When Morey next called him, at 4:15 a.m., Harden emitted "a little happy noise," then immediately asked his GM, "Who we getting next?" Morey, who'd been up all night, shot back, "Can we just pause one second to celebrate the Hall of Famer we just got?" Indeed, Houston now boasted two singular talents with high basketball IQs, both motivated by unfulfilled goals. Both had also procured reputations as stubborn, ball-dominant and edgy, often difficult leaders. Paul chose Mastro's Restaurant in Los Angeles to celebrate his Rockets union with Rockets CEO Tad Brown, D'Antoni and team owner Leslie Alexander. The dinner conversation centered on communication, with Paul expressing a desire to know as much as possible about the team's blueprint. "It was clear," Brown says, "Chris was a guy who wanted to be part of the process." As the Rockets brain trust noshed on steak and pasta, Paul called Redick and joked with him about the great tax breaks in Texas. ON A WARM September morning in Houston, D'Antoni observes his new two-headed point guard monster from the club seats of an otherwise empty Toyota Center. Some of his players, including Paul and Harden, have gathered for their daily scrimmage, and their coach is focused on one thing in particular: Who takes the ball out after a basket? D'Antoni abhors the notion of having to designate one player for this assignment. Within minutes, it becomes apparent this won't be necessary. When a 3-point bomb by Ariza drops through, Paul instinctively retrieves the ball and fires it to Harden on the left side of the floor. Next time down, when Ariza scores again, it's Harden who is nearest to the basket, so he plucks the ball out of the strings and fires it 20 feet upcourt to his new running mate. The ball zips up the floor as the two point guards feed off each other. There's Paul lofting a lob to Clint Capela for a slam. There's Paul again, as Harden fills the lane on the wing -- the ball falling into Harden's hands. "It's unbelievable," Harden will say later. "I don't have to dribble, dribble, dribble. I can shoot it. Right now. Because I'm wide open. Catch and shoot. I haven't done that in five years." Roland, who has trained Paul since his days in New Orleans, says he's never seen Paul happier. In addition to Harden, both Ariza and Bobby Brown, who played with CP3 in New Orleans, have been constant companions since his arrival. "A bunch of us went to dinner the other night and talked about the AAU feel this team has," Paul says. "A bunch of guys who love to be in the gym." "It's gonna work," says Harden, who says he's giddy from the notion of Paul as a finisher on the pick-and-roll, as a midrange shooter, as a 3-point threat. "Chris is starting to understand what I like and what I don't like. Same with me. So later this season, when we're yelling at each other on the court, it's not because I'm mad at him or don't like him, it's because we're having honest communication." Paul is certain he and Harden will make a great pair "because we can help each other." But the rub is how they defer to each other. Case in point: Harden spent almost all of last season as the primary ball handler in transition for the Rockets. Paul has assumed that role for every team he's been on in his 12-year career. But Harden, quite simply, might be better at it. According to Houston's analytics staff, Harden led the league with 873 "kick-ahead passes," those advanced 25 feet or more toward the basket. The Rockets scored 477 points directly on such passes, tops in the NBA. By comparison, LeBron was second in the league with 777 kick-ahead passes, John Wall third with 633, and no one else had over 500. Paul ranked 27th with 267. Harden also scored or assisted on 4,538 points last season, one shy of the NBA record. The presence of Paul will invariably mean fewer field goal attempts and less scoring. Still, Harden insists he won't get hung up on numbers, shots or attention. "None of that," he says. "It's about winning. We've both dealt with the negatives, the frustration, the disappointment. We can't have anything leaking into our goals." Says Morey: "If Chris has the ball in a key moment and we make the wrong decision, or James has the ball and it goes bad, that's no big deal if it happens once. If it happens a few times, I can see tension developing. So let's see how it goes." Can they share playmaking duties? Who will run the break? Who takes the last shot? Who is 1? Who is 1A? Can two alpha males coexist with similar skill sets? Those answers, D'Antoni asserts, will make or break his new duo. Paul will need to learn to play faster, D'Antoni says. And Harden will need to remember he's alongside one of today's most gifted pick-and-roll maestros. Both will need to let go of their MVP aspirations. "It's really up to James and Chris. When stuff comes up -- and it will -- are we going to let it derail us, or are we going ahead with the plan?" Morey continually conferenced Paul and Harden during the preseason on potential trades (including the Carmelo Anthony watch), the sale of the team, roster moves and offensive sets. "We bring our players into the fold in a major way, to a point where some teams would claim we're making a major mistake," Morey says. Meanwhile, D'Antoni hauled Paul and Harden into his office and laid out the specifics of their workload. Paul will log 32 to 33 minutes and Harden 34 minutes a night. "I will have a Hall of Fame point guard on the floor at all times, I promise you that," D'Antoni says. Paul will come out of the game after five minutes of the first quarter, earlier than at any other point in his career. Harden, who prefers to play the entire first quarter, will now have to take a seat with two and a half or three minutes left. By D'Antoni's estimation, Paul and Harden will play 18 minutes together, including the final five of every game. That requires Harden to sit for the first four minutes of the final quarter. "I already know there will be times (when the game is close) and James will be saying, 'This is bulls--t, I gotta be in there,'" D'Antoni says, laughing. "And I'm gonna say, 'I don't know what to tell you. We talked about this.'" JAMES HARDEN WAS a college sophomore at Arizona State when O.J. Mayo, then a rookie with Memphis, invited him to meet some NBA luminaries who were in Phoenix for the 2009 All-Star weekend. Mayo led him to a ballroom at the Four Seasons hotel where the All-Stars were congregating. Harden stood in the back, wide-eyed, as he took inventory of the room. There were LeBron James and Dwyane Wade and Chris Paul, all engaged in a spirited round of the card game Bourré. The trio cackled and heckled one another as they tossed $100 bills into the pot. Paul paused midhand to say hello to a startled Harden, who said little as the All-Star made basketball small talk with him. "I remember watching LeBron and CP3 and D-Wade interacting and thinking, Wow, so this is how it's supposed to be," Harden says. "But then you get into the league and you realize how precious that is." Today, as Paul leaves a franchise and relationships in his wake, he's hoping, like every new kid in town, that a change of locale might yield new BFFs. Harden, for his part, says he regrets not getting to know Dwight Howard better while the big man was in Houston and vows not to repeat that mistake with Paul. The two have spent the summer bowling, eating, balling and taking in a Kendrick Lamar concert. Clippers coach Doc Rivers, meanwhile, is watching Paul's immersion into the Rockets with interest. He admits their relationship suffered at the bitter end. In early September, Rivers is sitting courtside at the TD Garden in Boston, where he returns annually to attend a charity event, and he says the disconnect between Paul and some of his Clippers teammates stemmed from accountability. "I thought when Chris rubbed guys the worst was when he messed up," Rivers says, "because when you mess up, you gotta take it. I didn't really think he did. But overall, he's a damn smart point guard, and you never have a problem coaching that." Some 1,850 miles away and three weeks later, Paul has just come down from the roof of the Toyota Center. Up there, he has just posed for photos alongside Harden, and he's buoyant -- until the topic turns to the Clippers. His smile fades, his brow furrows and he rubs his temples as Rivers' comments are relayed to him. "Let Doc be Doc ... " he says, trailing off. Back at the Garden in Boston, Rivers says that as far back as the start of last season he felt it was "50-50" whether Paul would leave. Paul, in Houston, vehemently denies this. "I was all-in with the Clippers," he insists. Rivers says the reason Paul has moved on is that he believes he can go deeper in the playoffs with Houston than if he'd stayed with the Clippers -- which Rivers disputes. "Chris earned the right to be a free agent," Rivers says. "But the grass isn't always greener. We tell players that all the time. They'll find out." Paul, on a bench outside the Toyota Center, considers Rivers' stance, then purses his lips as though he's just sipped a glass of spoiled milk. He tugs at his Rockets uniform and glances to his left, where Harden is sporting the same jersey an arm's length away. "Doc is exactly right," Paul says, his jaw set firmly. "You can hope the grass is greener, and it may not be. "But I'm going to walk around the corner and see."